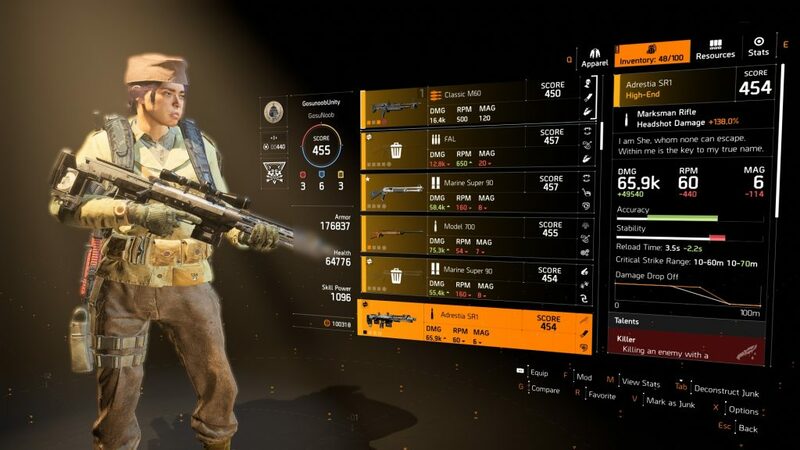 Marksman rifle scope – The Tally is a weapon part in The Division 2. You’ll get it when you deconstruct the high end sniper rifle called Adrestia SR1. If you’ve found this gun in a secret weapon crate and dismantled it, you’re probably wondering what to do with the part and whether it has anything to do with the Nemesis exotic. We’ve done a bit of research, and we’re going to share our findings in this Division 2 marksman rifle scope – The Tally guide. There’s no way to be sure at this point, since it’s only one part, but the leading theory is that this is a part of the Nemesis exotic sniper. The first clue is the name – Adrestia is the ancient Greek goddess of revenge, revolt and equilibrium. She is closely tied to another goddess called Nemesis – sometimes the two are even portrayed as one. The description of the weapon is another hint – it says “within me is a clue to my true name”. The key here could be the scope part, and the true name may as well be Nemesis. We’ll know more as we find more parts, but we’re quite sure we’re on the right track here. It’s unlikely the developers would present us with a puzzle like this for something less than an exotic weapon. How to get Adrestia SR1 sniper rifle? It seems like this is a unique weapon that was added in the new update. You’ll find it during the Tidal Basin stronghold mission. Before you do, you’ll have to get keypad code – after you clear the first big area, you’ll enter a building with satellite dishes on the roof. There will be a laptop you’ll need to interact with in order to intercept Black Tusk comms. Go up the stairs and look for the Black Tusk keycard on the bunk bed. Next up, after you finish the fight in the cargo bay of the hovercraft and get the objective to reach the upper deck, look for a door locked with a keypad in the control room. It’ll be on your left, while the objective marker will lead you to the right. Open the door and you’ll find the Adrestia SR1 in a box. Picked up the weapon. Keep your eyes open for the upgrades we talked about. After defeating Prime – the final boss for the invaded Capitol, you’ll get another part called Marksman Rifle: Barrel – The Scourge. FYI, I got a bolt for this called “The Scales” from Erin “Shorty” Linwood at the invaded Roosevelt Island. The barrel that you speak of from “Prime” is not 100% drop, as I ran that mission once to complete it and didn’t get it.